Capitol Hill resident John R. Wennersten is an environmental affairs writer and author of Global Thirst: Water and Society in the 21st Century. Co-author Denise Robbins is a writer and communications expert on climate change issues in Washington, DC. She regularly publishes articles dealing with all aspects of global and national environmental change, with a focus on regional politics. Global climate change is undeniable. Over the next few decades, as sea levels rise, storms intensify, and drought and desertification run rampant, hundreds of millions of civilians will abandon their homes, cities, and even entire countries. What will happen to these massive numbers of environmental refugees? Where will they go, what rights will they have, and who will take care of them? Over 200 million people in Asian countries live on land that will be affected by rising seas. Picture Pakistan, India, and China—all nuclear powers—skirmishing at their borders over access to shared rivers and farmable land with former coastal areas now submerged. Imagine tens of thousands of Pacific and Indian Ocean islanders cast adrift by waves that have drowned their nations, and more than 100,000 Caribbean islanders forced to leave submerged towns. Consider the complete abandonment of Miami Beach and other coastal communities up and down the Americas. At the same time, hundreds of millions will be desperate for water and a secure life in drought-ravaged Africa and the Middle East. 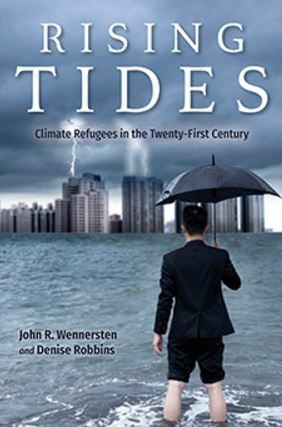 Rising Tides sounds an urgent wakeup call to the growing crisis of climate refugees, and offers an essential, continent-by-continent look at these dangers. The crisis is everywhere and it is imminent. Detailing a number of solutions, John R. Wennersten and Denise Robbins argue that no nation can tackle this universal problem alone. The crisis of climate refugees requires global, concerted solutions beyond the strategic, fiscal, and legal capability of a single country or agency. Capitol Hill Corner occasionally features works of literature and art by Capitol Hill residents. Email ljjanezich@hotmail.com.